My dog is breaking through the fence – what’s wrong? First, check that the collar is adjusted properly. The metal probes must be in contact with the dog’s skin for the system to work. The collar must be snug enough to keep the probes touching the skin – not just the fur! – at all times, even when your dog lowers his head to eat, drink or sniff. If the collar is tight enough, check out your battery. You can easily test your battery by taking the collar off of your dog and holding it close to the perimeter wire, and listening for the warning beep. Remember to hold the collar close to the ground – it needs to be at dog height, not your height, to function. We recommend replacing your batteries every 3 months (every 6 months for DogWatch® brand systems) for best results. 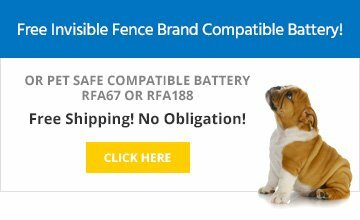 Consider a Fido’s Fences Battery Subscription Plan to ensure you always have a fresh battery when you need it. 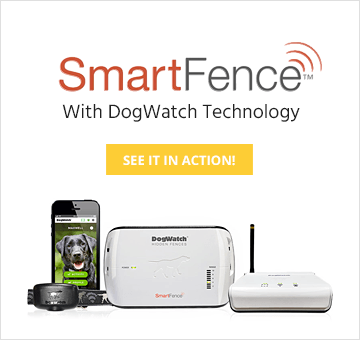 If you’re not sure if your receiver is working, remove it from your dog and take it to the fence boundary. Hold the receiver at the dog’s height (not your height! ), and listen for the warning beep. If the receiver beeps, everything is working fine. If you do not hear the beep, check your battery and receiver next. If the receiver is working and the collar fits properly, you may need to increase the correction level on the receiver. If the collar doesn’t beep when you test it and you’re sure you have a good battery, you may have a break in the fence wire. The wire is very sturdy but can be susceptible to breaks, especially if you’ve had construction or landscaping done recently, your area is prone to underground pests, or you’ve had a lot of bad weather. Give us a call if you suspect a wire break – we’ll send one of our technicians to check it out as soon as possible. You may need to increase the range of the signal field. Especially for a large dog, if the field is too small, the dog may be able to pass through it too quickly for the correction to have an effect. Adjust the transmitter to increase the field area (distance of the correction from the fence wire). After adjusting the correction level, you need to communicate this to your dog to prevent future escapes. You never want to intentionally lead your dog into the field, but the dog needs to experience the correction in order to understand the boundary. The best way to accomplish this is to take him into the area where the breakouts are occurring, and use a distraction to allow him to be tempted to cross the fence boundary, where he will receive a correction. As soon as he receives the correction, lead him back towards the house and praise him for going the right way. With proper training and fully functioning equipment, dogs rarely if ever escape. If you continue to have problems after taking these steps, contact us for refresher training for your dog. Check the outlet to make sure it is working properly by plugging in some other electrical item and testing. If outlet is working properly, then check the transformer (plug) for the system and the lightning protection device (surge protector). For maximum protection against power surges, it is important that the surge protector be properly grounded. This part of the system protects the transmitter from damage due to lightning power surges. If there were storms in your area, a power surge may have damaged the equipment. If all else is good, the transmitter may have malfunctioned. Call Fido’s Fences for repair of a replacement. I’m testing my receiver in the fence boundary but it just stops working. Why? Remember that your receiver has a safety shut-off in case your pet gets stuck in the correction area. After a certain amount of time, the receiver will turn itself off. This protects your pet from excessive correction levels. Just remove the collar from the fence area and try again. How should the collar fit on my dog? In order to function properly, the metal prongs on the receiver must be in contact with the dog’s skin. You should be able to fit one finger in between the receiver prongs and the dog’s neck. If you can fit more than one finger, it’s too loose and the dog can avoid the metal prongs simply by lowering his head. Dogs quickly learn how to avoid the correction while going wherever they want! If this happens, simply tighten the collar and re-train your dog. Once your dog realizes the correction is back in place, escapes should stop. My dog has sores on his neck from the collar, did the shock cause that? Absolutely not. The correction from the receiver collar is not nearly enough to injure your dog. Bald spots on your dog’s neck are a result of the rubbing of the metal prongs against the skin. Just like with humans, different dogs may have different tolerance levels for contact with metal. If you notice irritation around the contact point, we recommend removing the collar when the dog is in for the night, and replace it again in the morning. DO NOT loosen the collar – while this might seem to make your dog more comfortable, in the long run this will keep your pet containment system from functioning properly. If the irritation does not subside, consult your veterinarian or ask us about gentle fit prongs. What is a “Partial Break”? Partial breaks often occur when a previous wire break was fixed with electrical tape, or when the wire corrodes or degrades. Electrical tape works as a quick temporary fix for a wire break, but not long-term – over time will allow water to corrode the wire, so that the wire will need to be replaced. To fix a wire break, call your local pet containment system dealer or go to your local hardware store to purchase “direct bury splices.” These splices will safely and permanently fix wire breaks.